WARNING: This article contains SPOILERS!! 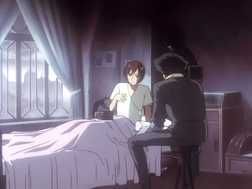 In an essay Leigh published about the parallels and ironies within Cowboy Bebop, the prospect of there being a deeper meaning to Spike's surname (Spiegel) was raised then promptly dismissed. I beg to differ. "early 13th century, from Old French mireoir: "a reflecting glass, looking glass; observation, model, example"; circa 11th century, miradoir (from mirer): "to look at" (oneself in a mirror), "observe, watch, contemplate"; from Vulgar Latin, mirare: "to look at"; variant of Latin, mirari: "to wonder at, admire" (see miracle)." The verb form of mirror is then defined as, quite simply, "to reflect". Spike certainly does a lot of that. He spends most of the series quiet and contemplative. I have my doubts that in those moments Spike is wondering if he left the oven on…or the lobster in the fridge, as it were. More importantly, Spike acts as a mirror for others. Consider this: were it not for mirrors, we would never know what we look like. Someone could describe to you what you look like and you can draw your own conclusions through touch and the instinctual awareness one has of their own body, but only a mirror (or yes, also a picture, but cameras take pictures with the use of mirrors too) reveals to you the truth of what you look like, hidden in plain sight. "Maybe. Maybe you are. But you're different. I can tell. Both you and Roco have something beautiful deep in you. It's hard to tell but it's there. I can see it... that's why I'm offering you tea like this." 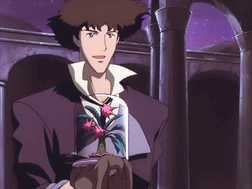 One might say that Spike is a reflection of Roco's deeper character and vice-versa. "Sorry. I dropped it... That ain't gonna work, is it?" Sounds like something a certain someone else might say... And didn't they meet later at a mosque/ place of worship, just like Spike had met with vicious in a cathedral in Ballad of Fallen Angels ("BoFA")? In WFV, right as a jazzy, upbeat song stops in the scene (like when, in BoFA, a somber song starts), Roco is shot (Spike falls) as glass shatters, creating uncannily similar visuals for the plant in WFV and the church window in BoFA. "He must have died because he was doing something wrong, I'm sure." Spike is a really good mirror. Then, Stella asks our metaphorical mirror what Roco was really like. Because when you have a mirror, you're bound to ask it questions (cough, Snow White, cough). Back home onboard the Bebop, Spike's present comrades also mirror his past ones. Eyes, which work based on mirrors (or lenses), are often viewed as a window into someone's soul and in the final session (The Real Folk Blues II), Spike confesses as much to Faye. Seeing the past in one and the present in the other. Much like Roco, Faye and Jet have Spike to act as a mirror for themselves. In Spike, Jet sees the brash, hot headed youth he himself use to be. Like Jet, Spike has already paid the price for his past mistakes, losing an eye while Jet lost an arm. "You told me once... that the past didn't matter... You're the one who's tied to their past!" "My... memory came back. But... nothing good came out of it. There was no place for me to return to... This was the only place I could go back to!" Once again, Spike reveals those truths hidden in plain sight, as a mirror does. I'm sure there's other examples of this throughout CB, but these are the ones that stood out to me. Finally, a quick note on the old superstition that a broken mirror brings bad luck. Funnily enough, despite having nothing but bad luck throughout the whole series, Spike himself never breaks. Even when Faye points a gun to his head, he doesn't bat an eye. When he's about to crash land in an old NASA space shuttle, he just calmly lights a cigarette while saying, "Whatever happens, happens" - even as the two people with him are in full on panic. Nothing fazes Spike.